The Basset Fauve de Bretagne with an ideal height of 32 to 38 cm (12.5 to 15 inches), a short wiry coat and red wheaten in colour is easily distinguished from the other French Basset breeds. Easily capable of clearing fallen trees in his pursuit of quarry (rabbit to wild boar), this remarkable hound is by nature friendly and outgoing. Notable features to the head are the slightly aquiline, medium-length foreface and ears at the same level as the eye. The ears have a distinctive pleat from the root ending in a point, are covered with finer smooth hair, and are of a darker colour than the coat. It should be remembered that the Fauve is an active hound with an enthusiastic urge to hunt and owners should respect this. As with all the recognised French Basset varieties, the origin of the Basset Fauve must be sought in the much larger variety of Fauve. It therefore seems reasonable to say something about the original Fauve from which the Basset Fauve derives many of its characteristics. By the 16th century there existed in France four varieties of large hounds, the difference between them being most noticeably that of coat colour and texture. The four varieties were the white (du Rol), the fawn (de Bretagne), the grey (du St Louis) and the black. All of today’s varieties of French hounds seem to stem from repeated crossings and mutations of these four types. These Grand Fauves de Bretagne as they came to be known (The Fawn Hound of Brittany), were very large hounds standing between 70 and 74 cm at the shoulder. They were noted for their fire, dash and drive, particularly in the early stages of a hunt. Their fearlessness, their fine nose, their resistance to the cold and wet and their ability to hunt their quarry, usually wild boar, made them ideal hounds in the thorny thickets of North West France. These now appear to be extinct in France. The only other representative is the Griffon Fauve de Bretagne (48 – 56 cm) which is still popular in France. However, so far there are still less than 10 in the UK. Turning now to the Basset Fauve: There is considerable doubt about how the overall size reduction, in particular the reduction in height by about half, was achieved. One theory suggests that it began by the selection of under sized specimens from a full sized litter, another by breeding from the smallest and slowest over countless generations. However it was achieved, there can be no doubt that by the late 19th century there were numerous packs made up entirely of Basset Fauves. It was thought that by the end of the Second World War the breed was almost extinct, and that out-crossing took place, but after some research and discussions with Mme. F Corbeau of the Club du Fauve de Bretagne she informed us that this was incorrect. In fact the Basset Fauve was always popular with huntsmen throughout the West of France in the early part of the 20th Century. We discovered in the 1970s that as the Basset Fauve became popular, French huntsmen decided to introduce new lines. It is generally thought that the Basset Griffon Vendeen was used to possibly improve their hunting ability and the Red Standard Wire-haired Dachshund to retain their colour. In any case we have many suppositions but not many well-proven facts. By 1985, 884 were registered with the French Kennel Club. This increased to 1,500 by 1998. In 2005 the registrations were 997 – greater than the combined registrations of the Basset Griffon Vendeen’s and were only exceeded by Beagles. Due to the dedicated efforts of breeders the breed was re-established and its popularity and success in the show ring increased dramatically, culminating in M. Georget’s, Basset Fauve de Bretagne, Mick, being awarded Best in Show at the World Show in Verona in 1980. 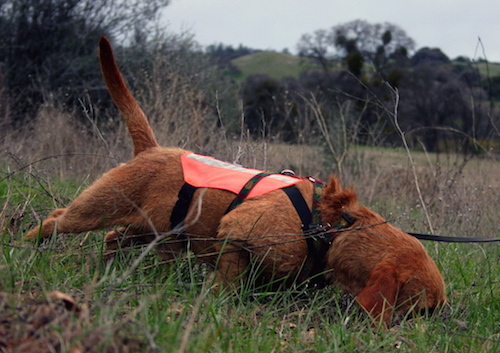 The Basset Fauve de Bretagne club was first registered with the Kennel Club in September 1991. Many of the founder members are still active in the breed. Given the breed’s impressive reputation in the hunting field, it was inevitable that in the days when there was no restrictions upon the movements of dogs into this country, some Grand Fauves would have been brought in to strengthen British (particularly Welsh) packs. There are many reports of this having been done. Mostly these refer to Welsh Foxhound packs and it is certainly true that even today one occasionally sees hounds with Fauve characteristics. On occasions Otterhounds have also been seen with a remarkable resemblance to Grand Fauves, especially as regards to coat colour and texture. Unfortunately there is a distinct lack of reliable documentary evidence regarding such importation. It is also reported that when the first Bretons left Wales many centuries ago they took their native dogs with them to France. These dogs were the ancestors of the dogs of Brittany. The first Basset Fauve to be imported into this country was Naika Des Vieilles Combes (photo above) from France in 1982, to be followed two years later by Hercule Ter Elst from Belgium and Fatima of Pooh Corner from the Netherlands. In 1987 Jolie Mogway of Pooh Corner was imported, also from the Netherlands. Both Naika and Jolie Mogway were imported in whelp. For many years these four Fauves imported by the late Evan Roberts were our only bloodlines establishing the breed in this country. In the early 90’s an article was published in the Dog Press by a team of geneticist highlighting breeds lacking in imported lines in which the Basset Fauve de Bretagne was named. With the introduction of the Bali Directive and Pet Passport several more dogs have been imported mainly from France and Sweden. This has complimented our bloodlines. Exhibitors of the Basset Fauve de Bretagne are currently enjoying success at Dog Shows in Britain and throughout Europe. The Basset Fauve de Bretagne was granted Championship status by the Kennel Club in 2007.